Demand the Vote - What Is Voter Suppression? “Voter suppression” is any effort, either legal or illegal, by way of laws, administrative rules, and/or tactics that prevents eligible voters from registering to vote or voting. And ever since the Supreme Court ruling in Shelby County v. Holder in 2013, Republican legislators have been introducing and passing as many voter suppression laws as they’re able to. WHO ARE THE TARGETS OF VOTER SUPPRESSION? People of color are disproportionately affected by voter suppression in comparison to white voters. Regardless of ethnicity, voter suppression also impacts the elderly, students, trans women, married women, and low-income or homeless voters. And the one thing that most of these voters have in common is that they statistically vote for Democrats. WHO DOES VOTER SUPPRESSION BENEFIT? In almost all cases, the people that benefit from voter suppression tactics are Republican lawmakers. Voter suppression laws are introduced by Republican state and federal lawmakers. They are passed in Republican-controlled state and federal legislatures. And they are signed into law by Republican governors and Presidents. The majority of the country supports the policies of the Democratic party. And when Democrats turn out at the polls, Democrats tend to win. Justin Levitt's 2014 study found 31 cases between the years of 2000 to 2014 out of ONE BILLION VOTES. And if you need to see more proof then read the Brennan Center for Justice's extensive report on THE MYTH OF VOTER FRAUD. WHAT DOES VOTER SUPPRESSION LOOK LIKE? VOTER I.D. LAWS - Proponents of Voter ID laws claim that ANYONE can just get an I.D. And many states offer them for free. However, “free” I.D.s have hidden costs, and in most cases they are not necessarily easy to get. Not everyone has a car. Not everyone lives close to an I.D. office. Not everyone has the money or time to take a day off from work to get an I.D. Not everyone has access or the money to pay for the documents needed to get an I.D. A recent study found that between 9,000 and 23,000 registered voters were deterred from voting in Wisconsin in the 2016 Election. To learn more, read the Truth About Voter I.D. 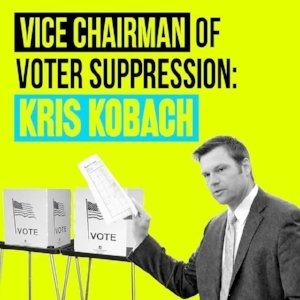 PURGING THE VOTER ROLLS - Notorious vote suppressor; former Kanas Secretary of State, Kris Kobach, who has been successfully sued by the ACLU multiple times for suppressing the vote, created CROSSCHECK. Crosscheck purports to be a benevolent program that compares voter roll data from state to state and removes duplicate entries to clean up the voter rolls. But, a Stanford study found that for every legitimate match Crosscheck it finds it produces nearly 200 false positives. This results in voters showing up to vote only to find that they have been purged and are now unable to exercise their right to vote. Another purging method is "Use it or Lose it". States such as Ohio and Georgia purge voters from the voter rolls if they do not vote after a specified period of time which results in voters unable to vote. LIMITING EARLY VOTING - Nearly every Election is held on a Tuesday. Early voting gives voters who may not be able to get time off from work, have family obligations, or any other legitimate reason an opportunity to vote before the official Election Day. States with competently implemented “no-excuse” early voting systems in place can see higher turnout numbers during the early voting period which will aid in shorter lines on Election Day allowing more voters to vote. If you cut early voting it means everyone is forced to vote on Election Day which can lead to extremely long lines which can suppress the vote. FELONY DISENFRANCHISEMENT - In every state, but two, voters automatically lose their right to vote when they are convicted of a felony. The concept of prison is that a person serves their time and their debt is paid to society. Adding obstacles to voting afterwards, essentially extends their prison sentence because they do not have the same rights as every other citizen. Click HERE to learn more about “felony disenfranchisement”. Or if you’re a voter with a felony conviction who needs help registering to vote or voting, check out Restore Your Vote from the Campaign Legal Center. GERRYMANDERING - Drawing electoral districts in order to favor one party, and in this case, the Republicans. After the 2010 census the GOP initiated Operation REDMAP in order to draw districts favorable to GOP candidates. This resulted in the Democrats often getting the most votes, but the GOP getting the most seats which you can see illustrated HERE after the November 6, 2018 election. Gerrymandering is one of the greatest threats to our Democracy because it denies legitimate representation in government. To be fair, this is one area where you can also point the finger at Democrats. But, not to the extent that Republicans do it. And even if this was an instance of “both sides do it”, only the Republicans are pushing policies that will limit access to the ballot box to enhance the impact of their partisan gerrymanders. UNDERFUND ELECTION DAY RESOURCES - Elections are paid for at the local level. So, If a county or district understaffs and/or under-equips polling places or closes them completely, this results in longer lines and longer wait times which can then lead to people being unable to wait and therefore effectively denies them the right to vote. CLOSING ID OFFICES - In states requiring specific forms of ID to vote, voters without it must go through the process of obtaining it. But, on more than one occasion officials have closed agency offices that issue the IDs voters need which effectively denies them the right to vote by denying them the ability to get the ID they need. DISINFORMATION - Voters receive official looking mailers with incorrect information on them like deadlines, polling places, and election times and dates. For example, during the 2011 Wisconsin recall election, the Koch-backed group Americans For Prosperity sent mailers to predominantly Democratic areas telling them to make sure their absentee ballots were in by August 11. The actual deadline was August 9. OFF-YEAR ELECTIONS - Off-year elections have historically low turnout. By setting elections on off-years it makes it easier for well-organized and well-funded interest groups to push their policy initiatives through. CAGING LISTS - A political party will send registered letters the addresses of people of the opposite party and if the letters are returned undeliverable then they challenge the legitimacy of that voter. The reality is that the voter may have just moved and never updated their address. Click HERE for more info. Voter suppression is an assault on civil rights, and is a threat to a legitimate representational democracy. We need to vote out any elected official that sponsors or votes "YES" on a voter suppression law, and pass laws that make it easier for all American to vote. There are many voting rights advocacy organizations where you can donate your time and money, but two we’d like to highlight are SPREAD THE VOTE and LET AMERICA VOTE. CLICK HERE to find out what it's like to vote in your state!